In 2016, fashion’s having another moment, though many would agree that’s not a net positive. The Instagram follower count of models has become more important than the ferocity of their runway walk, and most designers seem more attuned to the marketplace than their creative visions. 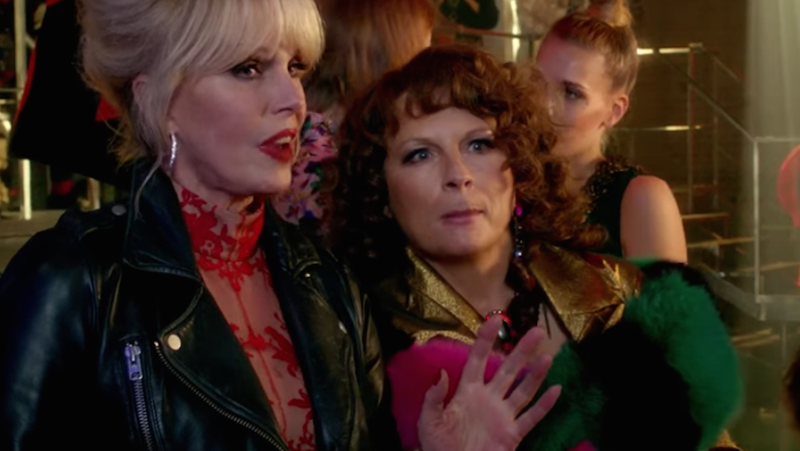 Absolutely Fabulous: The Movie recognizes the way things have changed—and, if there’s a deeper meaning at all in the most iconic translation of the vapid, reckons with that—but also lets itself live on the continuum, neither too nostalgic nor too current, which is mostly the best way it could go. Kate Moss is the crux, as she was then and is now. Edina and Patsy are still up to the old tricks—crashing fashion shows, mainlining champagne, embarrassing Edina’s daughter Saffy (Julia Sawalha)—but with the added element of aging, which scrapes the surface of Edina’s conscience throughout the movie but only slightly. This is AbFab, after all, and conscience is a plucky bird that emerges solely in tandem with the superficial: Edina’s saddest when she thinks she’s fat, or washed up. She barely blinks an eye, though, when she may have accidentally killed Kate Moss by bumping her into the River Thames at a fashion party celebrating a fictional designer based on Rei Kawakubo. That’s the central tension, a hilarious one that exaggerates and parodies the idolatry so rampant in fashion. Edina, cut off from ex-husband Marshall’s cash flow and unable to sell her memoir manuscript (apparently the only person on earth who can’t), hears that Kate is looking for a new press agent, and is determined to become her gal. When Edina ends up allegedly killing her instead, she becomes a potential jailbird and national pariah, so she and Patsy skip town to Cannes in search of a wealthy pornographer Patsy once dated to help foot the bill of their endless partying. More important is that Ab Fab is actually a laugh riot, and fashion people are more than game to be in on the joke. Moss plays herself, as do Jon Hamm (whose virginity, in the Ab Fab universe, was lost to Patsy), Gwendolyn Christie (“It’s Brienne of Tarth!” exclaims Lola, Saffy’s 13-year-old daughter), Stella McCartney and a phalanx of models, including Jourdan Dunn, Lara Stone, Lily Cole and Daisy Lowe. Jerry Hall rolls through in a funnily vacuous bit part as does Emma “Baby Spice” Bunton, and Jean-Paul Gaultier plays himself, a man who spends his free time trawling the beach of the Thames with a metal detector and administering wise bon mots. For real fashion die-hards, the fashion editor Magda (Kathy Burke) looks more than ever like veteran fashion critic Suzy Menkes, which is a little breathtaking until Suzy Menkes makes a cameo herself. The narrative is, as ever, silly and arch. The best parts come with the imaginative fashion—clear genius Rebecca Hale did the costume design; at one point Bubble, Edina’s personal assistant, wears inflatable chat clouds with emojis inside them—and, as ever, simply watching Edina and Patsy interact, their deeply subtle physical humor manifested in the slightest twitch of the eye. There are some uncomfortable, clunky jokes you wish didn’t exist, particularly one in which a white hairdresser demands Lola (Indeyarna Donaldson-Holness) straighten her hair—it’s in the service of showing how stupid the fashion industry can be, but it hits with a clunk—but overall, the fact that Ab Fab has been able to bring itself into 2016 so wonderfully is a testament to Lumley and Saunders’s chemistry. They’re a Laurel & Hardy for the fashion set and one of the greatest comedy duos to ever bumble onto the catwalk in a spectator hat.